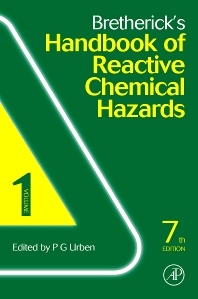 Bretherick’s Handbook of Reactive Chemical Hazards is an assembly of all reported risks such as explosion, fire, toxic or high-energy events that result from chemical reactions gone astray, with extensive referencing to the primary literature. It is designed to improve safety in laboratories that perform chemical synthesis and general research, as well as chemical manufacturing plants. Entries are ordered by empirical formula and indexed under both name(s) and Chemical Abstracts Registry Numbers. Chemists and chemical engineeers, safety officers, research students, chemistry teachers in schools, colleges & universities, all involved in storage, handling, packing & transportation of chemicals.